Is good health and sanity a Saigon pipe dream? This week has felt like little more than seven pages ripped off a desk calendar and left in a pile. And, in my case, it would be a pile buried beneath another pile of medicine wrappers and prescription sheets. Monday, I went to the doctor for the third time. I saw the same Vietnamese lady I’ve seen every time, and I still wonder if she really knows what’s going on. I told her my teeth hurt. It makes perfect sense to me since my sinuses are upset. She thinks maybe I have dental problems. I think she only believed that I was still sick when I spit phlegm into a cup for her. Between all my visits, she has given me so much medicine that I had to write on each thing when to take it. Otherwise, I’d never remember which ones had to be taken an hour before food or with food, which had to be dissolved two in the morning and one at night (or was it one in the morning and two at night?,) which ones causes dizziness, lightheadedness, and photosensitivity, and which ones were going to make me fall asleep within five minutes of taking them. I’m also spraying stuff up my nose and inhaling other stuff. My medicine regimen has more going on than a three ring circus. And, I’m still not well. I have been interning with the editorial staff of a magazine here since the end of January, and so far have been sick for almost half the time I’ve been known them. I’m missing out on opportunities to travel, to socialize, to learn because I’m tired and can’t breathe/can’t stop coughing. I have never been sick this long in my life. I’m not writing this for pity. I don’t want pity. I have enough self-pity to satisfy even the neediest person. Plus, even with Jonathan in the States, I have many good friends here to take care of me. I just need to explain why I’ve been silent. I am convinced that there is some correlation between sinus blockage and the amount of rational thoughts one can produce, and the few intelligent ones I’ve had this week have all been dedicated to AsiaLife magazine. I can’t be the only one that feels this way. It gives me a new respect for people with chronic illnesses. My three weeks of coughing and snotting is nothing compared to what many people live with – and live through. How can do you handle sickness in a healthy way? What do you do to keep your body from dragging your mind down? It is now 10:20pm on a lovely Saigon Saturday night, and I’m going to bed. I probably won’t sleep all night since I drink about two gallons of water a day, but I’ll try my best. I think my body will thank me, at least a little bit, in the morning. 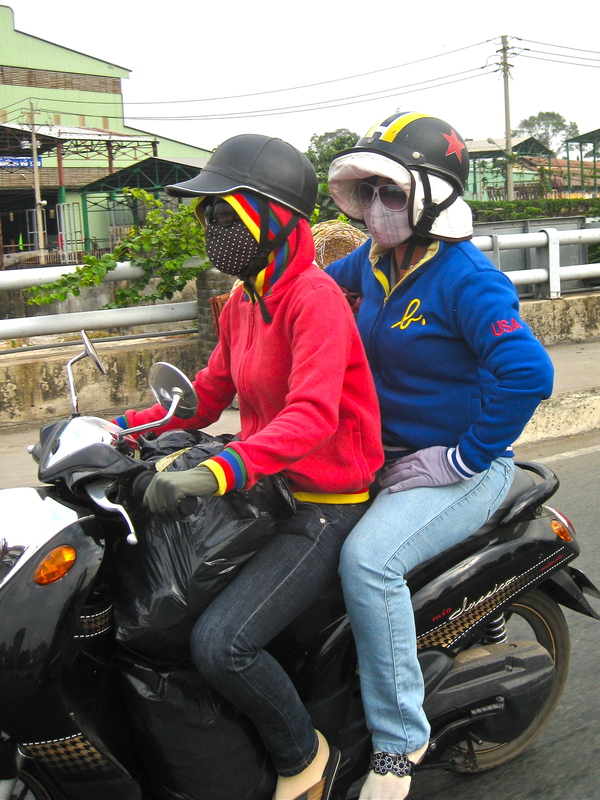 Maybe I should follow the example of these local ladies and wear a mask to cut down on the pollution. That seems so crazy a way to live in that heat. Hope you get well real soon. PS. I will be wearing sundresses and as little as I possibly can when I come for a visit! 94 degrees + humidity? Insanity. I am finally better. Not 100%, but I feel normal with an occasional cough. It really does start to mess with your head. I got a lot of sinus infections in my first few years flying. I hope this isn’t a recurring Vietnam thing.